Need a delicious way to eat bananas? Better yet, over-ripe bananas? If you are wondering what to do with the overripe bananas on your counter, these baked banana chips are the answer! Of course, you could always make a batch of Oatmeal Banana Muffins or Banana Chocolate Chip Granola Bars with overripe bananas, but I’m not always feeling so ambitious (meaning, I don’t feel like doing any dishes). That’s why this recipe is my go-to solution for creating a great, all-natural snack! This tasty, sweet-salty snack is perfect for using in place of regular chips and much healthier since they’re baked! 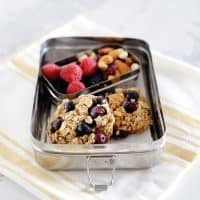 They make a terrific lunchbox add-on or after school snack. Kids love it as a packed lunch item to dip in salsa, guacamole or even hummus! 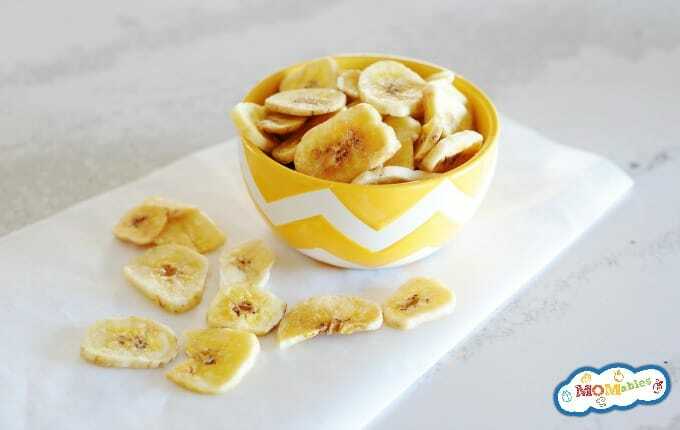 Yes, these banana chips are kid approved just like the recipes found in our Family KickStart Program! It’s a 30-day whole eating program designed with the entire family in mind. It eliminates all processed foods and junk, without nixing your kid’s favorite recipes. We have pancakes, and yummy snacks like these, the kids don’t even notice we’re eating healthier. 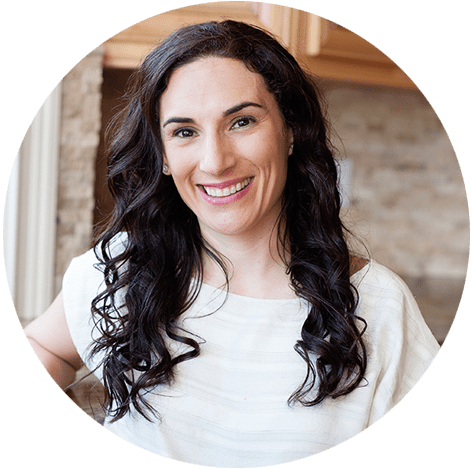 So many families just like yours have already done Family KickStart and discovered their kids approved of the recipes, and even asked for more when the 30 days were over! See what all the hype is about, and download a free sample here. A recipe note before you get into the kitchen, if the banana chips are still soft after coming from the oven, this is normal. The chips will harden as they cool down. How do you store banana chips? In an airtight container or zip bag for up to a week. You can also use green bananas or plantains. Make sure to soak the slices in a bowl with four parts water and 1 part lemon juice for at least 2 hours before baking as directed below (another reason why browned bananas work best, less wait time). I even like to sprinkle a little cinnamon over the chips, making this snack even sweeter! Turn over-ripe bananas into baked banana chips! This snack is easy to make and perfect for dipping with salsa, guacamole, or hummus! In a small bowl, combine 3/4 part lemon juice with 1/4 part water. Slice bananas very thin, about 1/8″ thick coins, brush with lemon juice and water mixture. Sprinkle with kosher salt. Bake at 250F for about 1 1/2 to 2 hours or until they are crispy, making sure to flip them over halfway through. Remove them from the oven and allow them to cool (the longer they cool the crispier they become). Use over ripe bananas and sprinkle with cinnamon. Follow baking directions above. Hi! I’m just 14 and your way of explaining these is really simple! Thanks for that!!! Just a quick question. The description above the recipes says to soak for 2 hours and then the recipe instructions say to brush with lemon and water. Which method works better? The tip above the recipe describes how to make banana chips that are lighter in color than when using regular yellow bananas. Following the recipe, as is, will result in a banana chip that looks like the images at the top of the post, and some kids don’t like that. If you want them to look like the ones you typically buy at the store (yellow) use green bananas or plantains and soak them for 2 hours first. I hope this helps clear it up. Thank you and good luck!! Let me know how they turn out. Hi,I read your blog named “Homemade Banana Chips Recipe – Baked” like every week.Your writing style is witty, keep it up! And you can look our website about love spell. I did everything as per instructions and then put them in the oven at 250 degrees centigrade and burnt them; presumably, the 250 degrees mentioned is in Fahrenheit, which would be approx 125 centigrade? The temperature is indeed in Fahrenheit. These need to go in the oven at about 100-125 celcius. I’ve done these before and they were delicious! My husband absolutely loves them! I dipped mine in lemon juice, placed them on an ungreased cookie sheet, and sprinkled them with cinnamon and sea salt. After 90 minutes I used a metal spatula to carefully loosen them from the pan and turn each one over. I cooked them a little extra on the second side, more like 45 minutes, because I sliced mine like 1/4″. They are nicely chewy with a slight lemon zing. I made them to eat on long runs, but they’re so tasty I may not have any left by then. Great recipe and so easy. That’s a great idea with the lemon juice! I just finished my first bag of store bought chips, and went so insane I immediately looked for a recipe. Thanks for the tips, Jim! Recipe sounds great! Will try these in our church 1yr old nursery as an alternative to animal crackers, Ritz and goldfish! Hi! We didn’t use plantains, so that may be why there are differences. I tried the soaking method and they all stuck to the parchment paper. I will try again and either spray the parchment paper with a little Pam or use the foil-type parchment paper. A little disappointed because I was really looking forward to those “chips!” Will have to wait till I have leftover bananas again and time! Spraying the parchment paper would definitely help! Hi! As long as you let them thaw out completely, I don’t see why you wouldn’t be able to! Frozen bananas are also great for creamy smoothies. No. You will not be able to use them for chips. Once frozen, then thawed, they will be mushy. FYI freezing bananas is a quick way to get them the right consistency to make banana bread. Lets say you have some black bananas that are ready to make bread, but are a few bananas short. Just freeze some bananas then thaw. They will be soft and ready. The flavor wont be as good as the black, overripe ones but will work fine. Will these stay good for a while? There is a sale at a grocery store on Bananas and I would like them to keep. Yes, you are essentially dehydrating the bananas. Please check the post for recommended storage. Enjoy! I have read the post twice and don’t see how long we can store these after baking. And should they be stored refrigerated or at room temperature? Amanda, this will vary by thickness of the slice. As you can see from the recipe, 1 1/2-2h. How ripe were the bananas you used? Did they look like the ones in the picture? I’ve made them anywhere from what you see here to right before they are only good for smoothies or banana bread. Wow some of these comments are so rude! Same here, bananas were 29 cents a pound yesterday so my husband and I bought 4 big bunches. I would like to make a lot of chips so I tried one banana sliced thin on the parchment paper but it is stuck to the paper. They taste great but I have to peel the paper off the chips. What did I do wrong? Would it work to spray a little Pam on the paper first? Spraying the paper first would definitely help! Question. The description of the recipe called for you to put the bananas in the over for 1 1/2 hours flipping half way through (which would be 45 minutes). But in the printable recipe at the bottom you say to put the bananas in for 2 hours, flipping after 90 minutes. bake for 1 1/2-2 hours, flipping them half way through. Derrick, chewy = needs more cooking/dehydrating time. enjoy! I was dehydrating something else, and did not fill all the racks so I am trying a banana in the dehydrator right now, dipped in lemon juice. I will let you know how it works out. Thanks for an easy snack that does not have sugar in the recipe. How long will they last in the pantry? a few weeks. they are dehydrated bananas essentially. enjoy! Just an air tight container or zip bag in the pantry. Hi, these look so amazing! I was wondering,…Do you have to add salt and cinnamon? Or would just the lemon juice work? the salt and cinnamon are optional. Brandy, these definitely won’t work straight on the pan. If you don’t want to run out of parchment paper again, you can always invest on some silicone baking mats. They last forever and they are pretty inexpensive on Amazon. so mad… this is a waste. the bananas stuck to the parchment paper and it is a total loss. nice recipe… thanks for the waste of my time and food. As I mentioned above, wax paper will not work for this recipe. Sorry they didn’t turn out for you but it has turned out for hundreds. 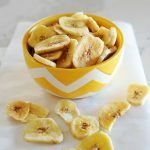 I can’t wait to try these- I really love banana chips but they’re always mixed with other stuff I hate so I never get to eat them, and I always have leftover bananas! Thx for the recipe! This was an epic fail for me. All stuck to parchment paper (yes parchment not wax ;)). what a waste of bananas and so disappointing :( they smell delicious. I really wanted them to work. I’m sorry this didn’t work for you. They peel right off in our parchment paper every time. I only have a lime, will that still be okay? I just tried this recipe for the first time, and when I took them out of the oven to flip over, the parchment paper had stuck to all the bananas, and was nearly impossible to get off! I then decided to try it again, and ended up putting more lemon juice on the bananas, so instead of just brushing them with my finger, I dipped the entire banana in the juice, and added some cooking spray to the parchment paper, that seemed to do the trick! They were absolutely delicious! I’m now going to make them every week and put them in my kid’s, and my lunch! These were a hit at my house. I thought the sea salt and cinnamon gave the banana chips an interesting twist. We used non-stick pan lining paper, one side parchment, the other foil. My son (5) also had fun helping. We will definitely be making these again. Thanks for the recipe! Alina, parchment paper and wax paper are not the same. Your issue was the paper. I’ve tried a few times but it came out chewy.. Any tips on what went wrong? Really hope to get this right. Ame – chewy chips can be two things: slices too thick or not baked long enough. Even chewy.. I bet they were good! Followed directions to the letter, did not turn out well. Don’t like the salt- weird tasting. Sorry they were not a hit at your house. Thanks for sharing these diabetic friendly recipes. Thanks for the banana chips idea! I had two bananas that had turned spotty enough that no one was going to eat them for breakfast tomorrow. I made ’em into chips tonight & put them in baggies for snack time at school. They are delicious! These are in the oven right now! I had a few bananas that were going to be past their prime very soon. They smell great! I’m not sure what I did wrong. They were either burnt or under cooked and on the same pan. I am gonna try again in a few days.